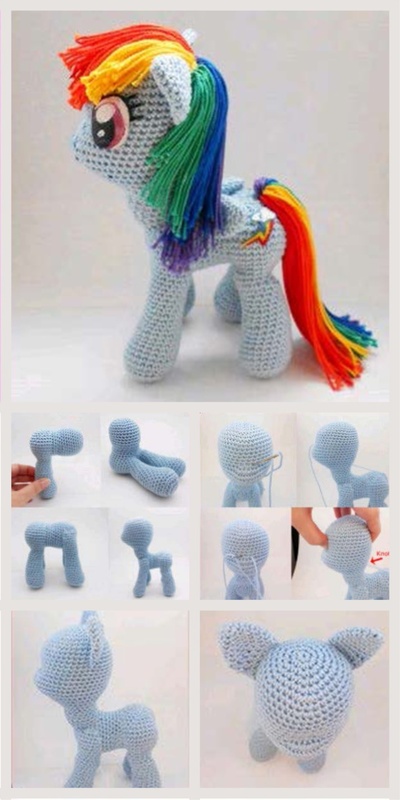 When using these materials, Pony is about 20cm. At the end of each line, the total number of loops in a row is indicated in parentheses. We knit in a spiral with the main color. Complete knitting ss. Lock and trim the thread, leaving the end for sewing. thread, leaving the end for sewing. We begin to fill the legs and continue to fill in the course of knitting. Secure the thread. Trim, leaving the end for sewing. Complete knitting ss. Lock and trim the thread. Legs in the place of their contact, starting from the front of the legs and ending at the back. 5 previously knitted loops connecting the legs are ignored. We continue to carefully fill the legs. Secure the thread and trim. The hole is tightened. leaving the end for sewing. legs, as shown in the photo. 2) Sew the front legs to the body. pass approximately along the second row of the body. the ends of the thread, pulling the muzzle, making it more expressive, and tie the threads. 5) Sew the ears to the head, a little further than it seems necessary (see photo). 7) Make eye sights and a special sign. 8) Make a mane and tail. 60-70в.п., And then back to each в.п. by 3c.